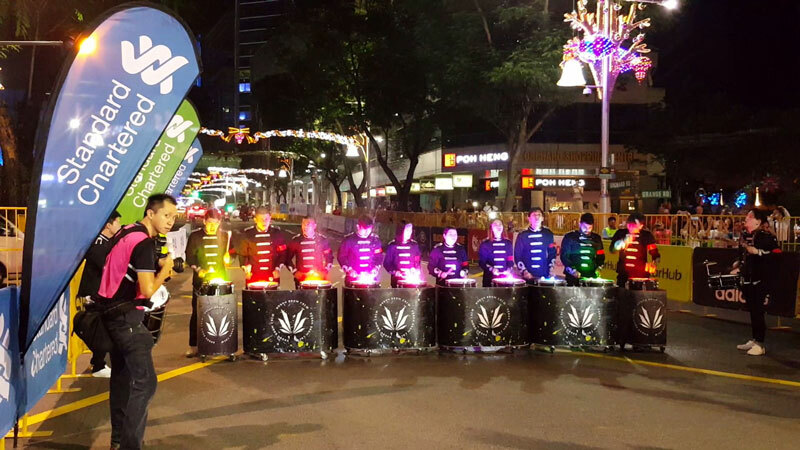 Race Review: Standard Chartered Marathon Singapore 2015 [FM] (by Lingderella) | JustRunLah! Years ago, I’ve been dreaming of running a marathon. But over the years, I have never make any actions to make it happen until this year, I took the courage to sign up for it to challenge myself. I didn’t really do many long distance run before the marathon and I am under training and that results in me walking the most of the last 7km. My longest distance ran ever was the Newton 32km challenge two months ago and then last month, I went to Great Eastern Women’s run, running my first half marathon. Other than these 2 long distance running, I rarely run more than 10km. I took 5 hours and 50 minutes to complete my first marathon, it isn’t too bad considering it as my first attempt but I’m not satified with the timing. Expectations increases. When I first signed up for the marathon, there was a question asking the estimated timing that I might take to complete the run, I thought that I may use more than 7 hours considering the worst scenarios such as what if I fainted half way or suffer from cramps or diarrhoea. When I was at the starting line, I really regretted signing up. I asked myself what if I can’t complete the race within the cut off time? Then I heard that Mr Chan, 85 years old this year is at his 101st marathon. If an elderly uncle can do it, so can I! At 9km mark, I realised the yellow portion on my race bib drop off and I really panic. And I thought ho seh liao, what if I couldn’t get my finisher medal and T-shirt? Who design the race bib like this? This is so important to me! My first marathon! So I approach one of the volunteer and I was assured that it dosen’t matter. I was really relieved. At 14km mark, I cried when I saw the distance board, the motivational words is something like this: When you feel like giving up, remember why you started. Why I started, what am I proving by running regularly for the past year or so? Run for a reason? Run to heal a broken heart? Run for the endorphins? But I don’t think we need any reason to run! Just run! I love running! I love the scenery in my running routes! Just run! After the 30km mark, it is really becoming a mental torture thing as I have never run more than 32km Just nice when I started to walk, the 5 hours 30 minutes pacers caught up. It is then one of the pacers keeps on encouraging us, assuring us and motivates us. He keeps on repeating: Go on a jog, follow us, we will bring you in 5 hours 30 minutes! I am sure many people is motivated by him! I am really thankful for him as I followed them till about the 35km point. Then I start to feel mild pain in my abdominal area which I think is because I drank too much water. I was handed my finisher T-shirt and finisher medal, I thought I will cry or even feel touched but I didn’t. I just want to find a place to sit down and don’t move anymore. I miss my bed. I was so tired that I didn’t feel the even look at the medal and T-shirt until after I rest. 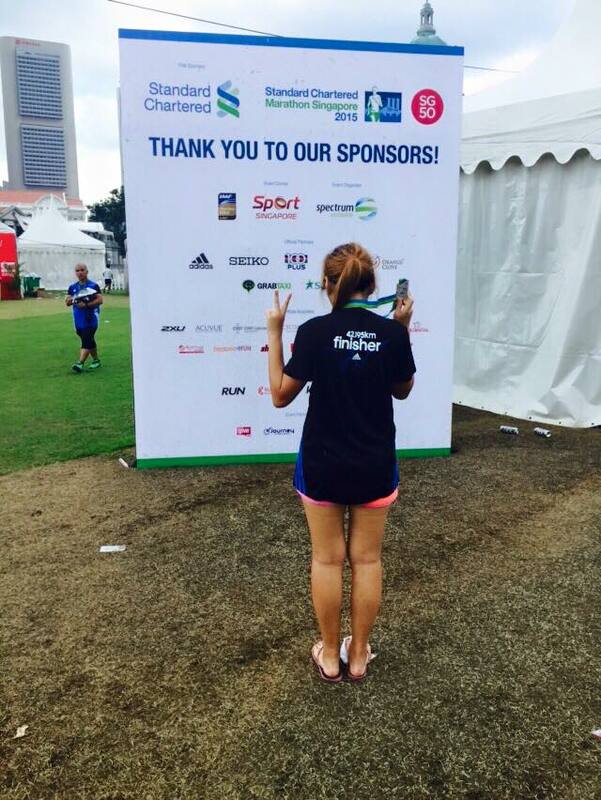 But I know and I am sure, I will be back at standard chartered marathon again next year.